–Building up to 35 railroad-style crossing gates at intersections along the busway. –Constructing two aerial stations for the Orange Line over Sepulveda and Van Nuys boulevards, along with bridges for the Orange Line bike path. –Determining that the project is statutorily exempt from the California Environmental Quality Act, which will help the project remain on schedule. These kind of exemptions are permitted for improvements to certain types of existing transportation projects that have already been built (such as the Orange Line busway) and are in operation. Gates would be similar to those used on the Gold, Blue and Expo lines and will be installed on all sides of the intersection to reduce or eliminate potential auto versus bus intrusions or collisions. Crossing gates will also enable buses to safely increase their intersection operating speeds from approximately 10 to 15 miles per hour to 25 to 35 miles per hour. Van Nuys and Sepulveda boulevards are qw the two busiest Valley streets along the busway corridor. Stand-alone bridges will physically separate buses from automobile and pedestrian traffic below. New aerial stations would be built on the bridges, as well as an elevated Class I bicycle path. All improvements are expected to cut travel times by approximately 20 percent between North Hollywood and Chatsworth. Metro staff will work closely with the Los Angeles Department of Transportation to ensure crossing gates operate as efficiently as possible. Metro will explore operating buses less frequently but with two-vehicle platoons to increase passenger capacity while minimizing the frequency of gate activation and delays to cross traffic. The plan is to break ground on the project in 2019 and have it completed by 2025. The project has $286 million from Measure M and another $75 million from Senate Bill 1, the gas tax and vehicle fees that went into effect in late 2017. Here’s the staff report. •Receive-and-file a Feasibility Study/Alternatives Analysis for the Crenshaw Northern Extension project with some routes going to West Hollywood and Hollywood. Staff report and Source post. 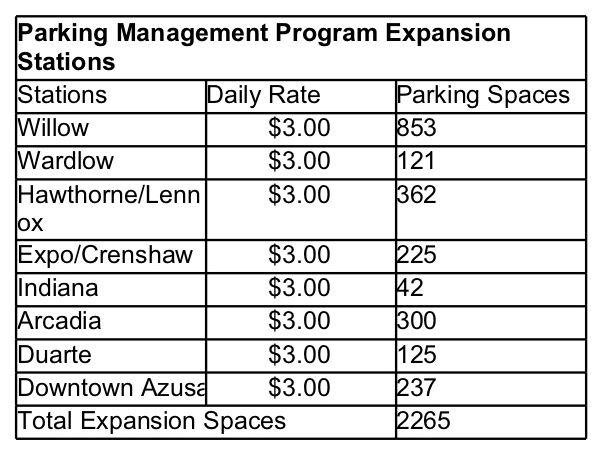 •Expand the paid parking program to eight more Metro Rail stations with fees beginning in the fall. Staff report. •As part of its efforts to reduce greenhouse gas emissions and lower its fuel costs, the Board will consider a $54.8-million contract to expand Metro’s use of biomethane fuel on its bus fleet. Biomethane typically comes from dairy farms, wastewater treatment plants or landfills whereas natural gas has to be extracted from the ground via drilling. Staff report. •As part of the Gold Line extension to Claremont and Montclair project, the Board will consider approving an “Amended Shared Use Agreement” with BNSF railroad to share the rail right-of-way between Glendora and Montclair. As part of the Gold Line project, the existing BNSF freight tracks will be moved within the right-of-way to accommodate the new light rail tracks. The same agreement and moving of the rail tracks took place on the Gold Line extension to Azusa. The light rail project held a groundbreaking ceremony in December and utility relocation work is underway with a target project completion date of 2027. Staff report. Regarding the Orange Line Improvement Project. Of course this will help, but is putting lipstick on a cow the needed result. It is time to do this right and upgrade this to a rail line.The gates can’t improve the needed capacity due to blocking cross traffic on the many very busy streets. It will not help the uncomfortable, cramped, bumpy ride on the bus. Capacity, speed. comfort and cost of operation are just a few advantages of a rail line over a bus lines. The overnight storage and repair division for the upgrade of the Orange Line to rail and the Sylmar – Van Nuys lines can be combined at the Conga Park bus division. No need to throw good money away to sightly improve the Orange bus line, just up grade it rail now. This is impotent. I’m guessing the bridges over Sepulvda and Van Nuys would be a necessary precursor to rail conversion. Wasn’t the upgrade part of their long range plan? The conversion to light rail for the Orange Line is part of the Measure M program, albeit a very distant project (2050s) at this time unless funds can be found to accelerate. Bridges over the busiest streets will help with that conversion when it takes place. To encourage weekend/off peak ridership, Metro should seriously consider free parking after 7pm and on weekends. Give another benefit to taking transit. Most agencies give free parking on nights and weekends – BART does it after 3 pm. They recognize that paying for citation writers is a money losing proposition. Metro may be cute and install automated license plate readers at its stations to issue tickets 24/7, but charging someone a $50 “fee” to park and take transit for a Dodgers game or New Year’s Eve is a surefire way to discourage ridership. Re: pay parking. I live two miles away from Wardlow station: a five-minute drive. The bus on Wardlow only runs every 30 minutes. All of the bike lockers are taken, I’ve been on the wait list forever. The sidewalks leading to the station are broken and in some places missing. So how am I supposed to get to the Blue Line, if not by car? Helicopter? You need to add more secure bike facilities, fix the sidewalks and increase bus service to the station *before* you start charging for parking. By ignoring those things, and going straight for the revenue stream, you are making the Blue Line less attractive, and incentivizing me to simply drive to work. On second thought, Joe’s Parking will be making $1.58 million to “provide improved functions” for the eight stations. I’m not sure what that is, but I’m sure it will be worth my $3 per day! Motorists win again, great job LADOT & Metro. “Operating buses less frequently but with two-vehicle platoons” will most likely result in reduced patronage. Lower headways is what increases patronage. Most passengers will normally be attracted to the lead vehicle in each platoon, leading to overcrowding it relative to the trailing vehicle. If the trailing vehicle falls back, will the lead vehicle wait to for the trailing vehicle to catch up? What if after every station they switch lead and follow buses? If the headways are ok, but can not be increased, opening more seats with a second vehicle will make the ride better. Great idea except it has loads of problems. Bus operators laying games, buses that accelerate differently(same type bus, different performance),different dwell time at stops, etc. this is from a former RTD/MTA Bus Operator and Supervisor. Giving the Orange Line quad would make the Blue Line a joke with it’s standard crossing layout. If Metro won’t change that, then Union Pacific should. Either way, it’s sad to see a bus line have more safety features than a rail line. Is it possible to build one more aerial station if bike bridges are not built to reduce the scale of bridges and save money? Although theoretically a fully utilized bike path may be able to let more people to travel than a busway, build one more aerial crossing for the bus seems to benefit more people than building bridges for bikes at the two intersections. Any cost data for not building the bike bridge? Bike bridges are a lot less expensive than bus bridges. Probably not enough. I see more people not paying their fare, paid parking seems to have increased this occurrence.